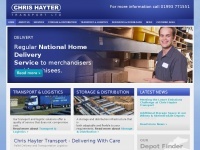 Chris Hayter provide a delivery and pallet distribution service across the UK. We also have a number of storage warehouses around the country. Keywords: Pallet Delivery Transportation Logistics. Urbanelement.com is specified as the websites creator. Copyright Chris Hayter 2011. All Rights Reserved is the owner of the copyright for this website. The web server with the IP-address 54.246.209.119 used by Chrishayter.co.uk is owned by Amazon.com and is located in Dublin, Ireland. There are many websites run by this web server. The operator uses this server for many hosting clients. In total there are at least 491 websites on this server. The language of these websites is mostly english. The markup language of the website is XHTML 1.0 Transitional. The visitor analysis software Google Analytics is used to analyze the visitors of the websites. The website does not specify details about the inclusion of its content in search engines. For this reason the content will be included by search engines.